First up, because it's not all about being indulgent, are these buckwheat pancakes﻿. These are gluten-free and don't contain any refined sugar. Delicious with smoked salmon and goat's cheese. These sugar-free coconut milk pancakes are also great for people cutting out sugar who still want to enjoy some pancakes. They are made from a combination of coconut milk, coconut oil, coconut flour, shredded coconut and buckwheat flour - great served with apple sauce. Now for something a bit more indulgent. This crepe cake or thousand layer cake takes a bit of time to make, though there are not really a thousand layers of course. The layers are sweet pancakes sandwiched together with crème patissiere and you slice it like a cake. Savoury pancakes are great as a main course. Don't be put off by these Spam and mushroom filled pancakes - you can use any kind of tinned or chopped ham, and they taste really good. When it comes to breakfast, how about these buttermilk pancakes with sausage gravy? I first had sausage gravy in America - it's basically diced sausage in a white sauce which makes a great alternative to a fried breakfast. Who remembers Findus crispy pancakes? I used to love them when I was a kid so figured out a way to make my own ham and cheese crispy pancakes! The pancakes are coated in breadcrumbs and fried until they turn golden brown; cut into them and the ham and cheese filling oozes out. I'd forgotten how good these were! But there's no need to complicate things and sometimes you want something simple. These American-style banana pancakes work for breakfast or dessert. I don't even like bananas and thought these were really good! The buttermilk makes them extra fluffy. And finally, here's a recipe for vegan pancakes - just because you don't eat eggs or milk doesn't mean you can't enjoy pancake day! These are really good and there are all sorts of toppings you could try, from fruit to the traditional lemon and sugar. 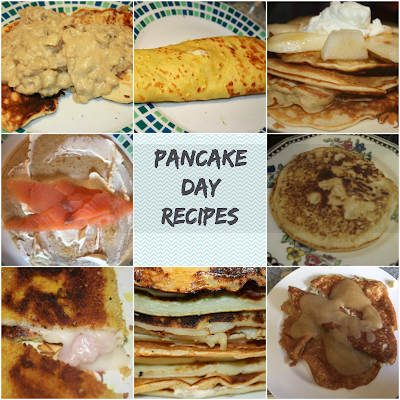 What's your favourite pancake topping and what are you planning to make for Pancake Day? Let me know in the comments!